Muong Khuong market takes place on Sundays and is located in a small border town, which is frequented by Flower Hmong, Tu Di, Tay and Giay ethnic minorities. They come from surrounding villages to buy and sell local products such as food and material for agriculture and fabric. 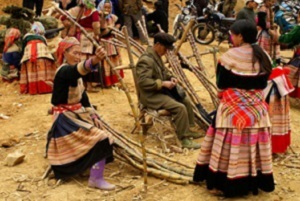 Muong Khuong district is planning to remodel itself into a centre of community-based eco-tourism in northwest Lao Cai Province in its current period of development (2005-10), said the chairman of the district people committee Nong Van Hung at a recent tourism conference. The district, which has 13 markets and seven handicraft villages, has chosen tourism as the driving force that can better the lives of its population of 51,000 who s current capital per head is VND3.5 million (US$209).